Venosan 4002 Compression 23-32 mmHg Lace top, Thigh length self supporting stockings are manufactured in an ingenious sandwich construction and are the first compression stockings worldwide to be awarded the Tactel climate effect label. These luxurious velvety soft lace top thigh lengh stockings have an opaque look, reinforced heel and toe, and are of the highest quality. Breathable fabric the Tactel climate effect ensures excellent wearer comfort. AVAILABLE TO SPECIAL ORDER: Please allow 10 to 15 days for delivery of these . 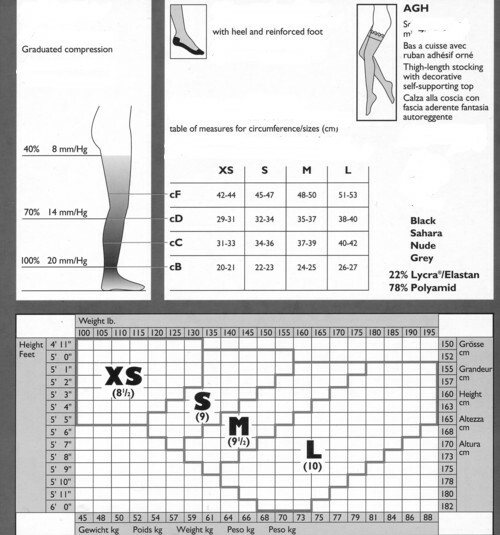 Venosan 4002 Compression 23-32 mmHg Lace top, Thigh length self supporting stockings are manufactured in an ingenious sandwich construction and are the first compression stockings worldwide to be awarded the Tactel climate effect label. These luxurious velvety soft lace top thigh length stockings have an opaque look, reinforced heel and toe, and are of the highest quality. Breathable fabric the Tactel climate effect ensures excellent wearer comfort. AVAILABLE TO SPECIAL ORDER: Please allow 10 to 15 days for delivery of these.